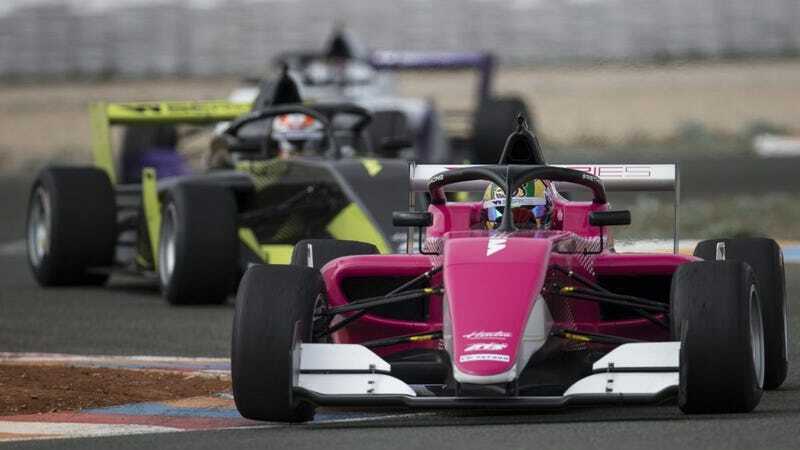 The W Series, racing’s only all-female category since the early 20th century, has finally selected its final list of drivers who will be competing on track later this year. Five months after the announcement that they were going to be hitting the scene, the series has taken shape. It’s pretty rare for the public to get a look into how drivers are selected—usually because the process is pretty straightforward. Many current F1 drivers signed on with a junior driver training program at a young age and have progressed up the ranks since then. Others have the money or the surname to buy themselves a seat (we’re looking at you, Lance Stroll). But the W series has done something different. In order to narrow down the list of potential applicants, they put their female drivers through a series of tests to evaluate their performance on and off the track. The most recent—and final—round of evaluations took place this week at Spain’s Circuito De Almeria. 28 women from around the globe gathered at the track for four days of intense testing. Hintsa Performance were at the Almeria test to continue the work started in Melk which covers elements of fitness, nutrition, sleep and recovery, jet lag management and psychological skills to help the drivers perform in the pressured environment that is motorsport. The team delivered training sessions that included bodyweight-based exercises for full-body conditioning, floor-based work, trunk exercises, rubber bands to add load, stretching techniques to mobile stiff joints, as well as playing a hybrid of netball and handball, followed by tag rugby to work their cardiovascular systems. So, basically, this last test was designed to both evaluate the drivers’ skills on track as well as their physical capabilities. The first three days determined twelve competitors who blew their competition out of the water, with the final day dedicated to a final six shootout to determine who would both race in the series and who would be a reserve driver. Those familiar with American racing will notice that ARCA driver Natalie Decker did not make the final cut. Those familiar with F1 feeder series will notice that former F2 driver Natalia Kowalska also didn’t make it. It will be interesting to see how this all plays out—both in terms of how the series will perform, but also in terms of how drivers who did not make the program will recover their careers.